My fiancée and I got up early on Sunday morning and made the long schlep via transit, somewhat hung over, from scruffy, bohemian Parkdale to an antiseptic mall in suburban northwest Toronto. I neither put up a fight about this nor felt dragged there; in fact, it seemed like it might be fun so I went along with it — no matter how alien to my values attending a gift registry party at Crate and bloody Barrel might seem. We orient ourselves in the contemporary world somewhat differently, she and I. The similarities: We both believe in living our car-free lives downtown; we both vote NDP; we both make the kind of choices at the grocery store that the previous biographical details might lead you to guess we would. Where we’re different: She sees no problem with coming home and plopping herself in front of the TV virtually every night, whereas I didn’t have cable before we were dating. She screws up her face at the mess and scattered human wreckage of the west end of Toronto; she consents to live here because it’s where the action is (not to mention the shopping, and homes that earn for you like bank stocks). For my part it’s largely the chaos itself I like. She said to me not too long ago, vis à vis our wedding, “I want things to look expensive.” That would never enter my head. I want things to look like I’ve put some thought into it — to look clever, if anything. I don’t care what the Joneses are up to and never will. Boil it all down and you could call her values urban bourgeois and mine laid-back, tweedy urbanite. The kind of stores I would have liked to register sell stupidly expensive European design stuff; they aren’t continent-spanning corporate empires with the capacity to turn your registry into a shiny clicky thing online. 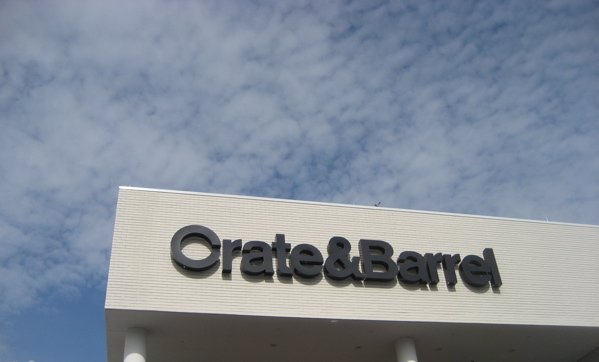 So Crate & Barrel it was, with all its evocation of barbecues and dinner parties in tidy, soulless McMansions in hermetic American suburbs. I am not Mr. Boho or anything, but all the same I can feel uneasy at an aspirational chain store in a way that she never does. I heard on the radio recently (CBC, naturally) that shared values are the strongest predictors of the future prospects of a long-term relationship. I don’t think I ought to be worried, though. The differences can work. Take last Sunday: I actually enjoyed myself. As the man, I took the little barcode scanner thingy they give you when you shop your registry, and it was as fun as you’d imagine. Beep beep beep. Mine mine mine. I’ll be damned if I didn’t add my own spoons and glassware and whatnot to the list. I don’t take myself seriously enough to be too stubborn about where my cheese dome comes from. Besides, where she goes, I follow, knowing she’d usually do the same for me. It sounds like you two could use one of those online registry websites that let you put things on it from any store. Try myregistry.com or one of those…that way your stupidly expensive european design stuff and crate & barrel cheese dome could live together in harmony on one registry. Kind of a metaphor for your relationship?